Pilates is the practice of analyzing movement patterns to identify inefficiencies. Pilates targets and corrects these patterns to reduce pain, increase athletic performance, and prevent injuries. To learn more about the many benefits of Pilates and our studio, click here to check out our blog! You can also follow us on Facebook and Instagram to stay up to date on specials. All Classes, Privates, and Duets must be booked in advance. 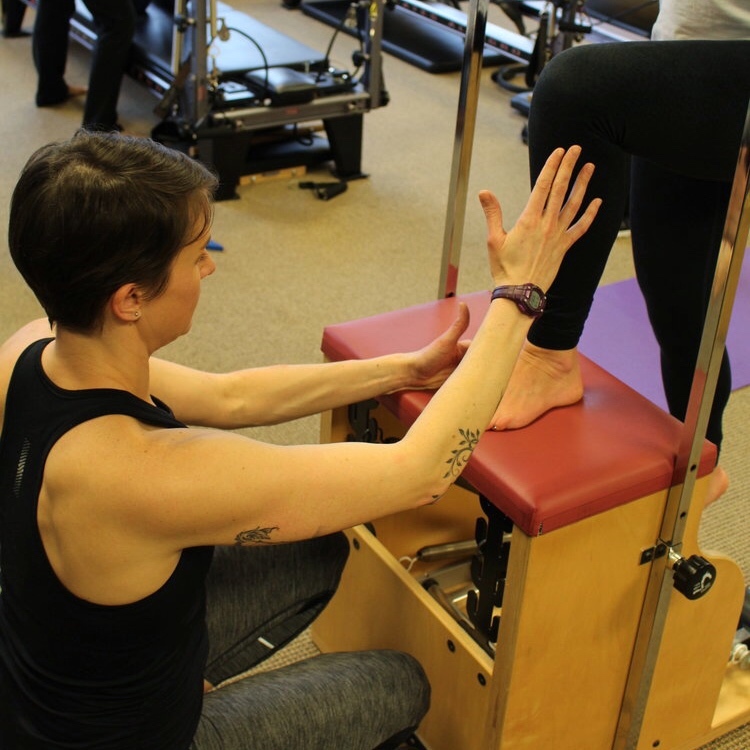 Our group reformer classes are a great way to keep up on your practice after you’ve been introduced to the reformer through private lessons. Group Reformer classes will have 5 people max so that each participant will receive individualized attention and modifications when needed. Our group reformer classes also include the use of the Pilates chair, spine corrector, and mat work. Two types of classes are offered on our schedule: Athletic and Restorative. Our teachers are trained extensively to teach to the bodies in front of them, however, we’ve found that some clients prefer a rigorous workout while others are using pilates for rehabilitation or restorative purposes. We’ve categorized the classes accordingly to help you choose the class that will best fit your needs. Tailored to each client’s specific needs. Your initial private session will include a thorough physical evaluation followed by a 55 minute session utilizing a comprehensive set of equipment including the Trapeze Table, Reformer, Chair, Ladder Barrel, Spine Corrector and Mat. Private sessions are unique to each client and can be used to enhance performance across an array of sports or to address pain. Please contact us or book online to schedule. With a duet session both clients save money and still receive individualized attention! The Pilates Duet Session is designed similar to a private session but includes the fun of sharing it with a friend, partner, or co-worker. Motivate each other as you work towards your goals! Please contact us or book online to schedule. Cross Training specific to the body’s core is imperative to increasing athletic performance and preventing injury. In Mat Classes, you’ll get 55 minutes of just that! This is a great introduction to everything Pilates has to offer! All exercises are presented at multiple levels to accommodate every student. No Pilates experience required! Drop in every Tuesday 12:30pm, Friday 4:30pm and Saturday 9:15am, $14 each for 10 class pack or $18 drop in. Our high-energy and dynamic barre classes integrate elements of Pilates, dance, cardio and strength training. Barre uses small, controlled movements, as well as weights, to sculpt and tone your core, hips, legs, and upper body. Barre classes provide an athletic workout and are great for anyone who is looking to improve their fitness, strength, posture, and mobility. Whether we are extremely active or mostly sedentary, our bodies develop trigger points and blind spots from overuse, underuse, and misuse. In this class we will learn self-care massage techniques using grippy Roll Model® Method therapy balls to help our tissues recover from everyday abuse. Looking to take the endurance training up a notch (or three)? Our TRX classes take Pilates to the air, utilizing strength to support our bodies. The Pilates Suspension Method, performed on TRX, is a great strength workout used to build endurance.